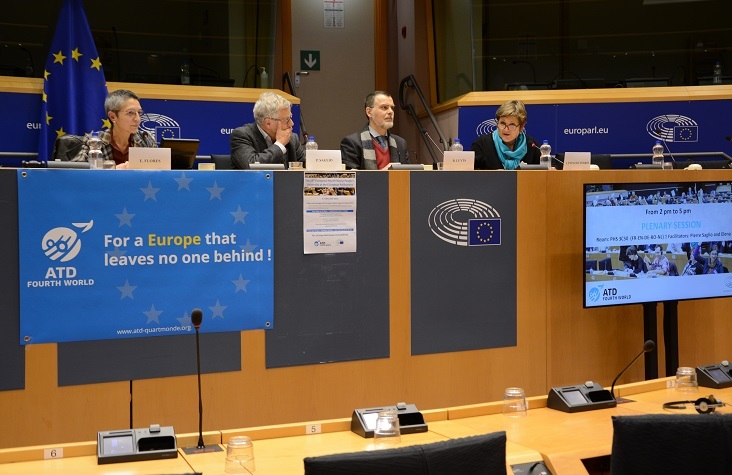 Isabelle Pypaert Perrin, Director General of ATD Fourth World, spoke at the European Parliament at the conclusion of the European Fourth World People’s University in February. Some have expressed regret that there are not more members of the committee or parliament with us. Nonetheless, it is very encouraging to meet in the European Parliament and to see that it is possible to talk with each other, despite coming from different backgrounds. We can learn from one another, reflect together, and develop relevant proposals that will be useful in the next European elections. First, let us place today’s meeting in its historic context. It has been quite a journey–one of more than 40 years–to leave our mark on the development of a Europe for all. It was a journey of some of Europe’s most excluded people joined by friends from European institutions, the public sector, and the Parliament. The journey also included people from the “extreme poverty and human rights” intergroup, members of NGOs, and anti-poverty networks. Like us, these people believe that we cannot build a Europe of human rights and peace without including the poorest citizens of Europe. It is thanks to this history that we are together today in the European Parliament and that people take us seriously and consider us as partners. This has occurred despite that fact that sometimes people do not listen to us in our children’s schools. Often the injustice we experience does not move anyone on our streets or in our town to action. This gathering is taking place even though life continues to be difficult and poverty continues to separate parents and children. We are here despite the fact that some of us still must live outside the law and without rights. We are asking Europe new and essential questions. We have also shared knowledge and political proposals based on contributions from people who face the violence of poverty every day. These people are primary activists for change and a more just world. Today it is clear that the world is facing great dangers. Europe is weakened and has not fulfilled many of its commitments. Yet we still believe in the importance of people coming together like this. We believe that putting an end to poverty requires people getting to know one another and sharing their ideas, their understanding of what works, and their questions. We must unite both our intelligence and our courage across the borders that divide us. We continue to believe in a Europe of equal dignity for everyone. We cannot stand for people being crushed by poverty regardless of where they live or where they come from. We continue to believe in these things and to not give up because we are following the example of mothers who get up every day without knowing how they will feed their children. We take our cue from all those who resist poverty on a daily basis, weave solidarity with one another, and invent new strategies–especially those who do all this for their children! And there are a lot of them in this room. With very few resources, they continue to share with each other and to make room for other people, especially for those who are less fortunate. All these people around the world show us a way to meet the challenges ahead. They unite us in an approach that does not leave anyone behind. We have learned from experience that if a single person stays behind, abandoned, there are no guarantees for anyone. In 2015, we succeeded in getting the principle of leaving no one behind embedded in international treaties and human rights agreements. This imperative appears in the collective complaints procedure, as well as the revised Social Charter which all States and the European Union should ratify. It is part of the European social rights base and represents one of the significant steps forward that we have made in recent years. Yet, our governments and the European Union still need to translate these agreements into political action so it becomes mandatory for policies and programmes to reach the poorest of our fellow citizens. Currently we see many dysfunctional ways governments may condemn certain people to non-existence. Even when the law exists, there are many people who do not dare to make use of it. 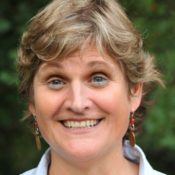 How are we to address rights violations and discrimination related to situations of extreme poverty? Doing so will require major changes because governments have never designed or implemented policies and programs with a focus on those who are the most difficult to reach. Today, we can no longer do without the experience and knowledge of those who resist poverty day and night. I am thinking of those parents who, even after social services take away their children, are willing to get involved in training social workers so that such injustices do not happen to others. I am thinking of the young people who come to Europe today, believing in the possibility of a future here. They find themselves alone on the streets and yet they support each other to hold on. In their courage and tenacity, these people remind us that we must put at the centre of our projects the human being, equal dignity for all, and the future of our children. This is the compass that should guide Europe and the world today. But if they are to help us stay on course, we must continue to create spaces like the one we have experienced today where different kinds of people can gather, where there can be cross-fertilization of knowledge, and where people in poverty can participate. This should happen at all levels, in schools, hospitals, universities, and our neighbourhoods as well as in national and European political bodies. Then, along the way, we will learn how to think, decide, and act with people who experience exclusion from democratic spaces. When we look around, we can tell ourselves that the horizon looks dark. But we have reason to be hopeful. People in extreme poverty who are defending human rights do not give up. Young people are not giving up either. They are not only protesting, but also trying to find new ways to organize and to work towards a better society. Yet, they see that the world at the beginning of this century is changing very quickly and is increasingly leaving people behind. It is creating fear and pessimism along with mistrust of institutions and the rise of extremism. It is up to us to support young people and encourage them to dare to ally themselves with people who remain invisible to others. We must help young people make the leap of faith that the world needs to make in order to address the challenges of our time and to attempt the reforms needed for humanity to have a future. we will continue wherever we go to look for those people who remain absent, the people who were not here with us today. Not because they had an important meeting or an overloaded agenda, but because they are still hiding in shame and fear, and do not yet know that they have something important to say. This is how we will build a Europe that leaves no one behind. And it is this Europe that the world needs, a Europe that meets the challenge of equal dignity for all and respect for the earth, within its borders and beyond them.